God blessed us with another amazing VBS Camp with 95 children attending (picture above). Plus, we had close to 30 adult volunteers show up to serve. What an awesome God we serve! Our prayers for this year’s VBS were answered in every way. God brought the children, the teachers did a great job, no accidents or sickness, no interruption by rain (which is a miracle in its own since we are in the middle of monsoon season where it rains most every day), etc. Most of all, God opened the eyes of the non-believing children who came and gave them understanding He is the one true living God and their need for a Savior in Jesus Christ. We were overcome by joy (and tears) as 22 children came forward at the altar call and asked Jesus into their hearts as their Lord and Savior (picture below). Plus, we had 7 of our adult volunteers, who come to church occasionally, come forward to re-dedicate their lives to Christ. We praise God and thank all of you who prayed and financially supported this year’s VBS. God is using you to impact these children for ALL eternity! 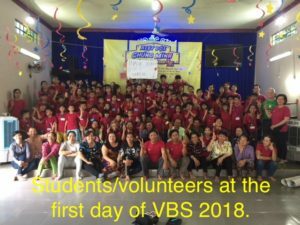 A couple of days before the start of VBS we sent Lan up to Tan Hung (the town 7 hours from Binh Chau that we visited last summer and 33 people asked Jesus into their heart) to pick up the kids there who wanted to attend our VBS. Lan called us stating that 2 brothers (Nguyen age 9 and Thien age 7) who wanted to come were running around it t-shirts only and she couldn’t bring them with her. We asked her to buy them each a set of clothes so they could come and we would buy them some more when they got to Binh Chau. During VBS we heard their heart tugging story. Since Tan Hung is a small town, there are not a lot of job opportunities. So their mother travels a long way to another town for work. Since she has no relatives in Tan Hung (no father involved), she leaves Nguyen and Thien with “friends”. However, the boys seem to have no supervision and run around town all day long with their friends, sometimes with very little clothing on. They told us when they come back at night often there is no food except what’s put outside for the dogs (scraps left from the dinner table). That would become their dinner. Thien has never been to school and Nguyen is already a grade behind. We were told last year that around 50% of the people in Tan Hung do not know how to read or write. Nguyen and Thein were definitely “rough around the edges”, but we soon learned they both had tender hearts. Their mother, Tri, who accepted Jesus last summeractually came to VBS to serve. Tri knew about our orphanage/love house from her visit to Binh Chau last year. She pleaded with us to take her 2 boys to live in our orphanage/love house. We agreed and the 2 boys stayed with us as their mother went back to Tan Hung. About a week later, Tri called Kim to say the grandfather of Nguyen heard rumors we might sell him to China and wanted to come get him. We found out then Nguyen and Thien had different fathers when we asked why he wasn’t concerned about Thien too. An uncle and his mother arrived to pick Nguyen up a couple of days later. We were only able to speak with him for a few minutes before he had to start back home, but we were able to show him the orphanage and church. Nguyen was sad to leave, and upon arriving at his grandfather’s house, couldn’t stop talking about how he loved living at our orphanage/love house. He begged his grandfather to let him return. The uncle also assured the grandfather we seemed like very good people. 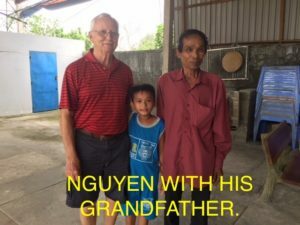 We praise God for softening his heart and the grandfather brought Nguyen back to Binh Chau (picture above). 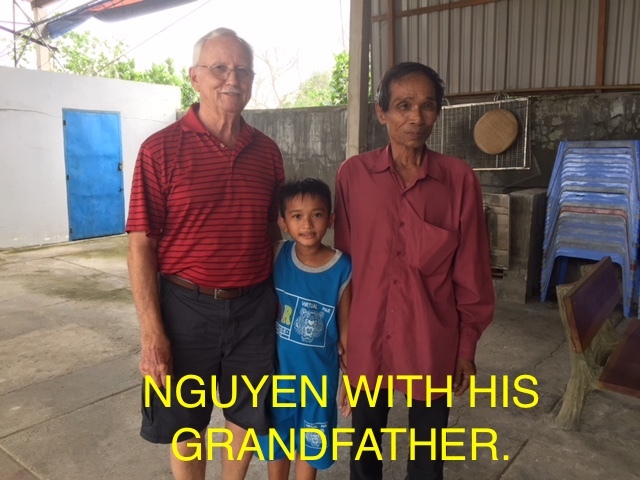 Not only was the grandfather impressed with the orphanage/love house, but God gave Mai the opportunity to share the Gospel, and the grandfather prayed to receive Jesus as his Lord and Savior. Take joy in knowing this is how God is using your prayers and financial support to change children’s lives like Nguyen and Thien for His glory! 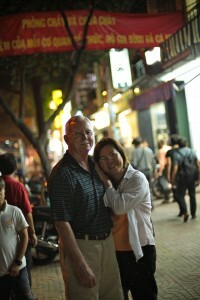 Please pray God will give us wisdom and discernment as we start the search for a new pastor for the Binh Chau Church. Pastor Luong’s 6-month evaluation period is up at the end of July and the Binh Chau Church leadership has voted not to extend his time of service beyond that. Please pray God will provide a new housemother for our orphanage/love house as the one we had left to take care of some urgent personal family matters. Meanwhile, we are serving as the house grandparents. Please pray God will give our youth many divine appointments as they go out on their weekly visits. 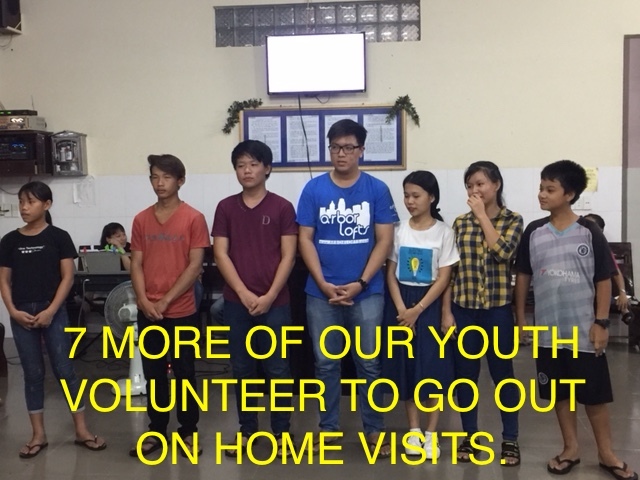 We praise God for the 7 recent youths (picture above) who want to serve on these visitation teams also. 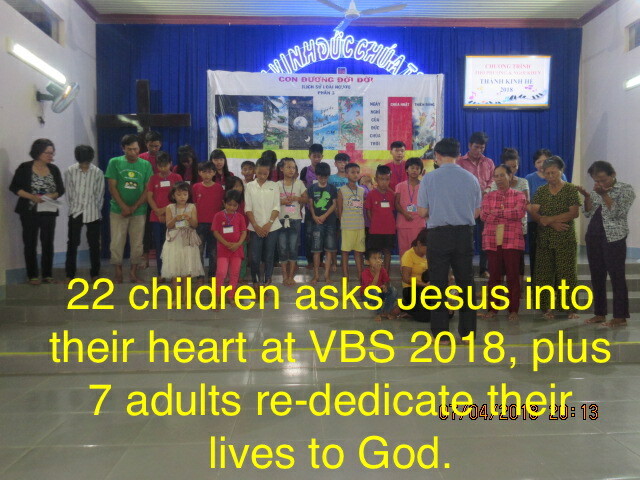 Please pray God will draw the 22 children, who asked Jesus into their hearts during VBS, to have a desire to start attending Children’s Church.